Chemical manufacturers provide liquids for a variety of industries, from cleaning products to flammable liquids. Depending on their viscosity and various consistencies, the chemicals need to be placed in a range of packaging products for shipment to their destinations. A chemical filling machine is best-suited for this important job. These packaging machines lower the amount of waste while being able to fill and cap a high volume of containers. In addition, these machines promote a clean and safe environment for workers. Here at PACK’R, we have the chemical filling machines that offer consistent and accurate results. We provide both turn-key and customized solutions for chemical manufacturers that are looking to build effective production runs or when upgrading existing equipment capabilities. A major issue that many chemical manufacturers experience is accurately filling containers of different sizes with product. Overfilling containers means giving away too much of your product. Underfilling containers can upset customers who are paying for the amount that was previously advertised. 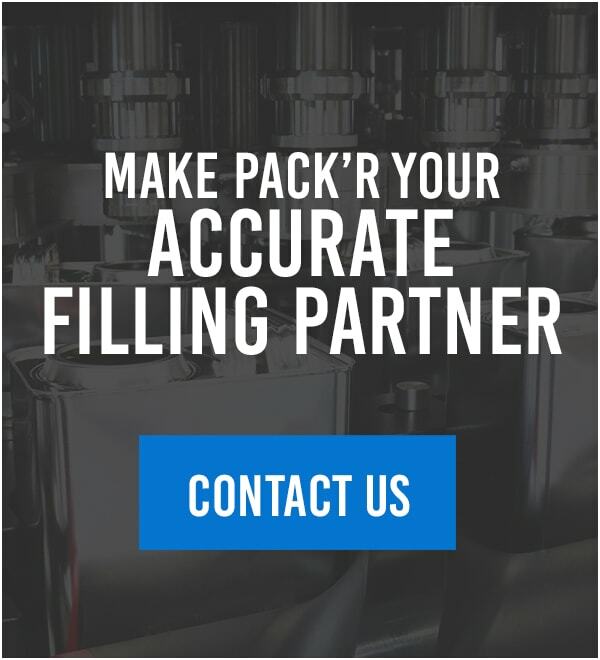 A reliable filling machine promotes more accurate fill rates for any type of chemical that is processed. 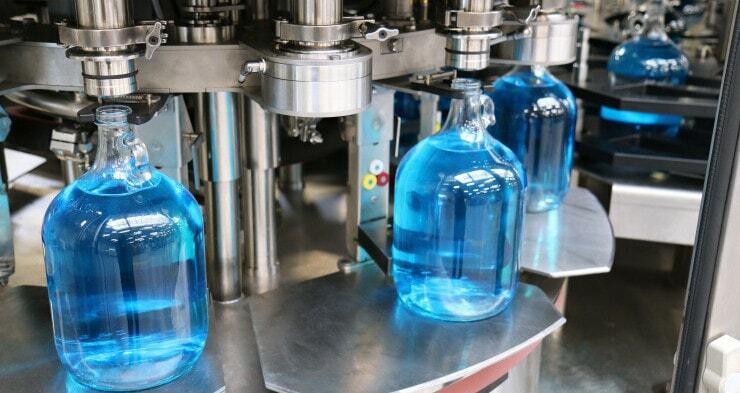 In addition to more accurate weight filling and capping capabilities, an efficient filling machine system can move liquids and withstand acidity levels without clogging or spillage. Whether the liquid is thick and highly viscous or thin and watery, the chemical filling machine can pump it at the desired volume and rate based on your operational needs. PACK’R is the leader in customized chemical filling machines. Our engineers design the filling machines based on the chemical product, container type and company operations. Customers select PACK’R for their chemical filling machine needs due to our versatility. Our filling machines can handle containers of all sizes including bottles, jerry cans, pails, drums and intermediate bulk containers (IBCs) that hold from 100ml up to 1,000L. Once the desired container is filled, your chemical products can then move to the automatic capping machinery to ensure a tight seal. Based on your production run, container and volume output, you can select from a wide range of capping machine innovations — such as a step-by-step filler capper to a semi-automatic or an automatic drum filler capper. Manufacturing operations can dictate the type of filling and packaging machines that work with your existing chemical processing equipment. PACK’R provides innovative solutions that fit your needs and budget. Our engineers collaborate closely with your workers to provide the right filling machines. You can decide on a single piece of simple turn-key equipment to increase the efficiency of your operations or a larger customized system that can better handle your production requirements. Reach out to PACK’R today to learn more about our chemical filling and capping machines. Utilize our innovative technology, industry-specific knowledge, and ability to handle any type of chemical product — even explosive materials. We’ll help you design, commission and upgrade your packaging machines so you can increase your bottom line.